These gluten free Oatmeal Chocolate Chip Cookies, filled with brown sugar, chocolate chips and gluten free oats, are my family’s favourite. I bet you can’t eat just one! Psst….come here…a little closer, I want to tell you something. These. Cookies. Are. Gluten. Free. There, I said it. But, if you don’t tell anyone, they would NEVER know. Seriously! These cookies are the based on the recipe for the cookies that I’ve been making my family for the past 18 years. 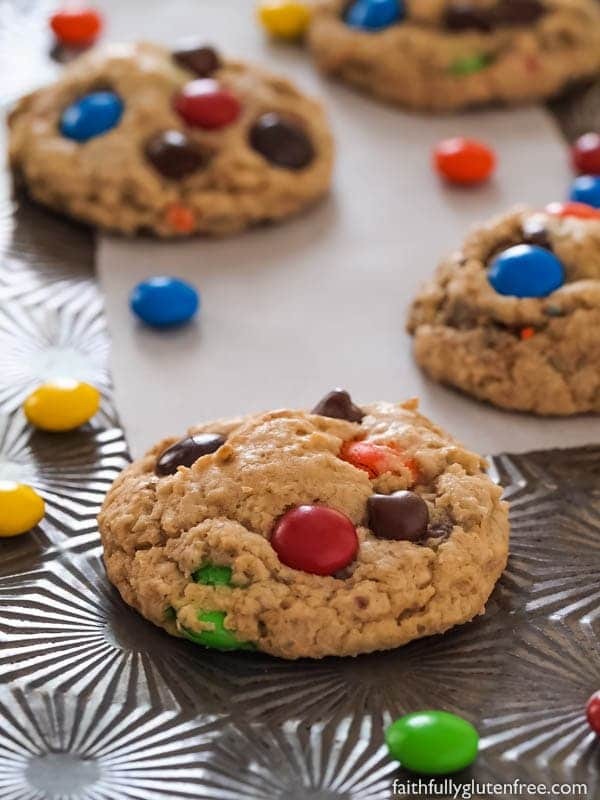 After being diagnosed with celiac disease, and having to adopt a gluten free diet, I’d make them for the rest of the family to enjoy, while I continued searching for a “tried and true” gluten free chocolate chip cookie recipe. Let me tell you…every single gluten free chocolate chip cookie recipe failed. None could live up to the standards that the old stand-by recipe had set. None were good enough. A lot did not contain oatmeal (chocolate chip cookies need oatmeal, in my opinion). Some were just greasy little flat puddles by the time they baked, even with refrigeration. Not one of those cookies could hold a candle to the families favorite cookies. Until now. For years, I have baked these cookies as a “first day of school” after-school treat. When the kids come home on that first day, there is a plate of warm cookies waiting for them, so we can sit and chat about all the new things they experienced that day. It’s become a great tradition. That doesn’t mean we limit these cookies to that one day only though, we enjoy them any time, year round as well. Sometimes I change things up a bit by using half chocolate chips, and half peanut butter or butterscotch chips. No matter what I do, they area always devoured in no time. I’ve fed these gluten free Chocolate Chip Oatmeal Cookies to family, friends, neighbor kids, classmates, and no one can tell the difference between these and “regular” chocolate chip cookies. They are that good. Seriously. If you can tolerate oats, try them, you won’t be disappointed! Now, if you will excuse me…I’ve got a cuppa coffee and a cookie waiting for me. You can’t doddle here, these cookies get gobbled up quickly. Get your butter out now, so it can soften while you read and print the recipe. These gluten free Oatmeal Chocolate Chip Cookies, filled with brown sugar, chocolate chips and oats, are my family's favourite. I bet you can't eat just one! Preheat oven to 350 degrees F (177 degrees C). Line a baking pan with parchment paper. In the bowl of a stand mixer, cream together the softened butter and the brown sugar. Scrape down the bowl. Add eggs and vanilla. Mix until fully incorporated. In a large bowl, combine brown rice flour, potato starch, tapioca starch, xanthan gum, baking powder and baking soda. Stir to blend. With the mixer running on low, incorporate the dry ingredients into butter/sugar mixture. Add the gluten free oats and chocolate chips, and mix until fully combined. Using a cookie scoop (or two tablespoons), drop cookies onto the prepared baking sheets, leaving about 2-inches (5 cm) between cookies. Bake in preheated oven for 11-12 minutes, depending on your oven. You want them to be slightly browned around the outside, but still slightly moist in the middle. Allow to cool on cookie sheet for 5 minutes before transferring to a wire rack. 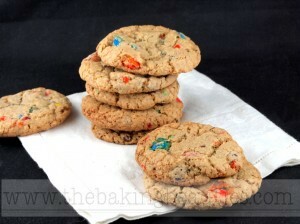 You can also make bakery sized cookies using this recipe. Scoop about 1/4 cup (60 ml) of dough per cookie, and flatten just slightly with the palm of your hand. Leave 2-inches between cookies. You will need to increase your bake time to about 13-15 minutes, depending on your oven. These look like picture perfect chocolate chip cookies 🙂 I wish I could have a few of them right now. These look wonderful. i'll have to try them. I've been in the cookie mood lately, but not in the baking GF mood. Hence, no cookies. Thanks for the recipe. Hi Carol! Thanks so much for the comment, I appreciate it. 🙂 And thanks for the link too, I have every intention of entering…just need to figure out which pic to use. Nice to know it can be older posts too, that helps. 🙂 Thanks again! I have a big bag of gluten-free oats in the cabinet to use up. I just found another use. Of course, my husband can't eat oats. I guess that just leaves more for me. I bet your daughter (and everyone else) loved these! These cookies looked wonderful so I made them once with terrible results:they were totally flat and all ran together in the pan but they tasted good so I had hope.I made them again and this time I refrigerated the dough overnight and when cooked they looked and tasted beautiful just like your picture.FYI! Thanks for a my kids new favorite cookie recipe! These are just perfect! Made a batch today. I am so glad it makes a big batch, because I wanted to take some to a get together, but my family wanted some, too. These were probably the best GF cookies I've made. I love it when they look normal and taste normal and don't fall apart! Thank you for a wonderful recipe! Oatmeal chocolate chip is one of my faves. Looking forward to when I can try more recipes. I have been celiac for 2 1/2 years and I just found your sight. Boy, oh boy, have I been missing out. Thank you thank you for this cookie recipe. I hate that most gf chocolate chip cookies are "cake-like". A chocolate chip cookie should be gooey and chewy. They were delicious! It completely made my whole day. AMAZING! Made them for my mums group. 3 year old kids and mums all loved them. Thanks so much! I made your recipe for a New Year’s Eve party yesterday. 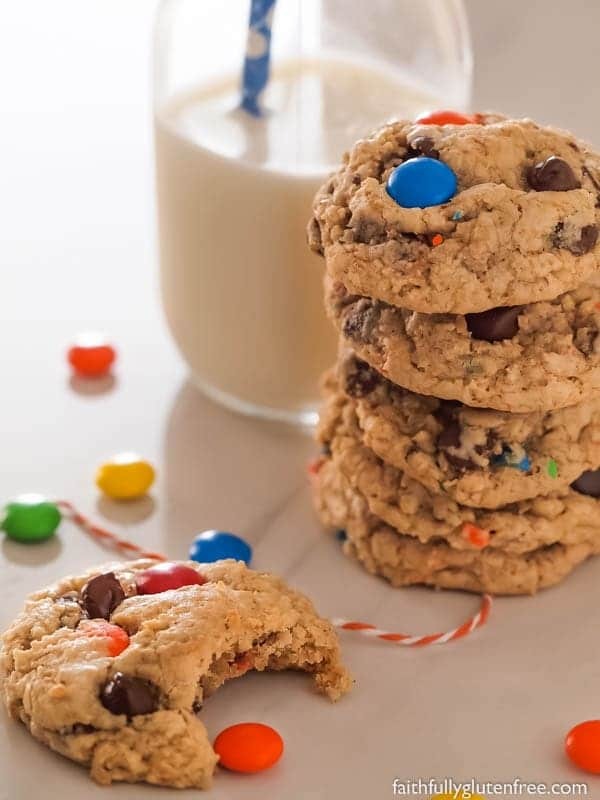 I have only been gluten free for a few months and I think these were the best oatmeal chocolate chip cookies I have ever made gluten free or not. Everyone at the party loved them and had no idea that they were gluten free! Thanks for the recipe! I too am having problems with cookie puddles. Can I subsitute butter for the Margarine?? Yes, you can substitute butter for the margarine. However, from my reading, butter creates a thinner cookie than margarine does. Shortening creates the thickest cookie. I would add a little bit more flour if you are finding they are still going flat. HTH. These cookies are baking now.=) My husband and 2 year old already named them yummy and “not gluten-free tasting”. 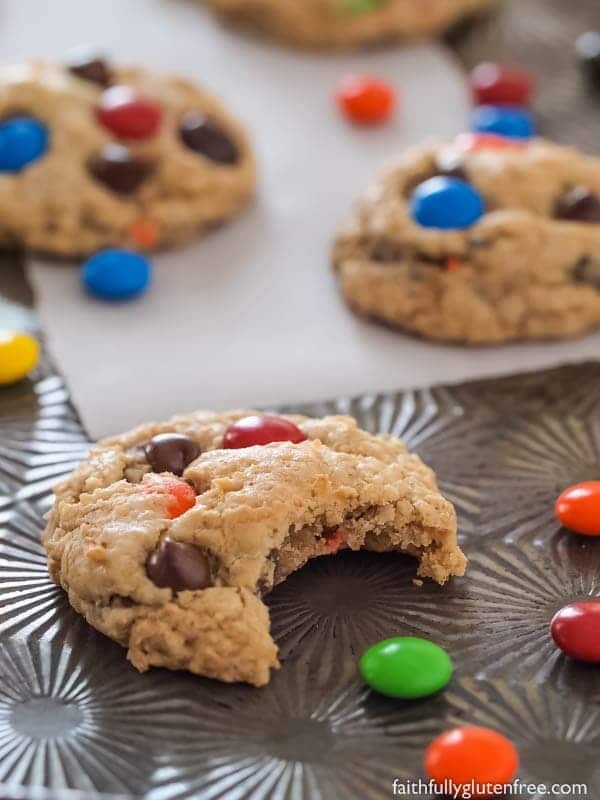 What I love so far is the ease of the recipe, very straight forward ingredients, and the cookies didn’t fall apart when I moved them from the cookie sheet to the cooling rack. I have had that happen plenty of times. I just have to tell you that your recipes are very consistent and I have learned to always search your blog first when I’m looking for a specific recipe. I have made a few muffins, most recently your pumpkin cream cheese that were so yummy and your sunrise rolls that were SO delicious! Thank you for being consistent and making easy recipes. There is another gf blog that I regularly follow and though her recipes LOOK amazing, I have had far too many fail and I feel that they’re for a more advanced baker, which I don’t claim to be.=) anyway, thought I’d share some encouragement! By the way, I used butter and my cookies weren’t flat at all. I have made these cookies numerous times, but substitute 2 tbsp ground flax mixed with 6 tbsp warm water for the eggs and use non-dairy chips to make them vegan also! I’ve also tried a huge variety of add ins, such as dried cranberries/raisins, hard shelled chocolate candies, nuts…everything is good! They are soft and chewy, just the way they should be! Thank you! After over 2 years of being gluten-free, I can finally tolerate GF oats! To celebrate, I made these cookies. They were AWESOME! Thanks for this recipe. These are some seriously solid gf cookies. Chewy and soft but with substance. I had to bake them on one sheet at a time and the texture of the first batch differs from the second because the batter sat for 15 minutes or so. The first batch turned themselves into square cookies and ran together and flattened. The second batch only slightly ran together and stayed round and thicker. I think I’ll let the whole bowl sit before baking next time. Both equally delicious though! I want to make oatmeal gluten free cookies for a person with Celiac disease,can I use Quaker Oates old fashion oats? I don’t know, if they are gluten free. Quaker oats are not gluten-free. To make this gluten-free, you have to use gluten-free (sometimes called pure) oats. What can i say. I love these! It is 11pm and after working for 12 hours I needed a treat! Came home at whipped these up in no time. Thank you for another great recipe!